Fides is from the the Latin meaning good faith, or trust. In the Roman religion, Fides was the Goddess of Trust. 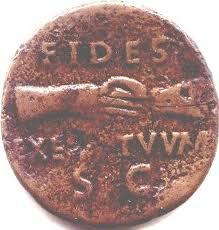 Also, Dius Fidius was thought to be related to Fides, and he was a god of oaths (Wikipedia). The term Bona Fide was considered to mean a "Guarantee of Good Faith". The term Fidelity was considered to mean "Faithfulness", and ask any Marine, and they will tell you Semper Fi means always or ever faithful. The term Affidavit (from affidare - to trust) means literally "He has stated an oath". From this, one can extend out to Federal: covenant, league, treaty, or alliance. Finally, we note that in the festival devoted to Fides in Rome, the priests conducted her services with their heads covered and the right hands wrapped up to the fingers to indicate absolute devotion to her and to symbolize "trust".